Kirstin: I have to apologise for not cooking anything from the Hummingbird book. I forget how busy every May is with birthdays and half term. But you made lots from it Maureen. What did you think? Maureen: All in all, another good effort from Hummingbird, but not my favourite book of theirs. They had some good recipes, but I think the last cookbook– or even the first one– was better overall. I feel as though the recipes are getting a bit repetitive now. Kirstin: The Gwyneth book has been a total winner for me. I will take this book on holiday and if nothing else, just look at the inspiring photos. I didn’t give up the gluten and modified as I went along. And I’m still not sure what Gwyneth did about that parasite and the heavy metals in her blood. I do hope her Doctor has treated them. What about you Maureen? Did you like any of the recipes? Maureen: I like what Gwyneth is trying to do here– get us all to eat better. I’m totally behind that. But what drives me absolutely crazy are the obscure ingredients she says I need to buy in order to get me there. Here’s some examples, just turning to three pages at random: gochugaru (coarse Korean red chili flakes), Vegenaise (Vegan mayonnaise– I have been unsuccessful in finding this brand in the UK), xylitol (I don’t even know what that is.) Also, there seemed to be A LOT of underlying smugness, which I didn’t like either. Needless to say, I have very mixed feelings about the book. Overall Grade (A- F): B/C (Maureen) It’s not one of their best cookbooks, but it wasn’t a total disaster either. Best recipes: Mississippi Mud Cake was a real favourite, and in fact, has already been requested again. Grade for Photography (A-F): B from both of us. Any disasters? The Grasshopper Slices. Never again. Bookshelf or Charity Shop Donation? Kirstin: I should probably bake a few before committing to either of these options. Maureen: I’ll keep it, but it certainly isn’t High Rotation Shelf worthy. Best recipes: Kirstin: Where to start? The roast chicken is amazing. I love the Thai burgers and the boneless chicken recipe. And I’ve yet to really tackle the fish recipes. Any disasters? Kirstin: No. Maureen: No, though the Chicken Francese wasn’t anything special. Bookshelf or Charity Shop Donation? Kirstin: I shall be getting this on my Kindle and keep the book too. I’ve given it to several others too and they have all loved it, so a total winner. Maureen: I’m going to keep it, because I do think there’s some real winners in here, but I’m going to have to learn to stop griping about the obscure ingredients I need to find. I look at the picture for my grasshopper slices and can think of only one thing: There’s a whole afternoon of my life wasted that I’ll never get back. Dear readers, it was a disaster. Yes, they look pretty. Yes, it is the classic tasty combination of mint and chocolate. Yes, some people even seemed to think they tasted good. But I didn’t agree with them. I certainly won’t be making them again. Where did it all go so horribly wrong? I’m not sure, but I’ll try to figure it out. First, with the ingredients. You need 1 kilogram of what is described as “good-quality white chocolate.” When I went to my local store, I had two choices when it came to picking said chocolate: the Doctor Oetker for 38 pence per 100 grams (total cost £3.80), or the fancy Lindt for £1.09 (total cost £10.90). Going for the cheaper chocolate might have been a mistake. But there was no way I was going to invest– and invest is exactly the right word– in just one ingredient for a recipe I hadn’t tried. 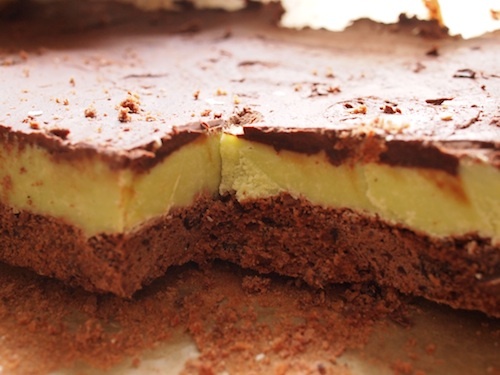 When it came time to make the mint ganache, by heating the double cream and adding it to the chopped white chocolate– it became a culinary disaster. The chocolate separated and the ingredients refused to combine. I stuck the whole mess in the refrigerator out of frustration and by the time it was time to assemble the slices, there was a whole layer of gunk on top of the mix, which I just skimmed off, threw away and tried to forget all about it. The brownies weren’t as a big as a disaster as the mint ganache layer, but they too proved to be a headache. This could have been down either to operator error or bad instructions, or a combination of them both. But the brownies were dry and not at all good. So all in all, a disaster. I won’t be making this ever again. Nicholas (10): These are going to be EPIC. Maureen: We’ll see about that. 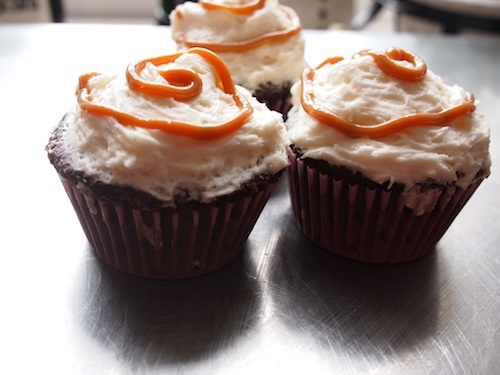 I think I might prefer the salted caramel cupcakes, but maybe that’s just me. NIcholas: I think everyone is going to love these. I’m going to call them my C + C Cupcakes. Maureen: Catchy name. I have to say that the instructions for these cupcakes are absolute rubbish. They could not be more vague. 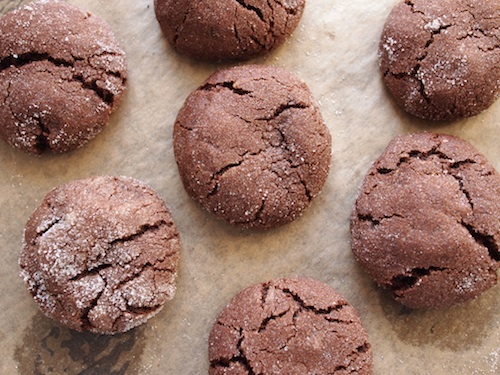 They say we need double chocolate cookies, like Oreos, but don’t say if they are with or without the cream filling. They also say we could make our double chocolate cookies. As if. Nicholas: Maybe I should run to Sainsbury’s and buy their big double chocolate chip cookies? Maureen: Good idea. We can use those for the cookies. Nicholas: Just as I predicted: EPIC! Maureen: They’re interesting, I’ll grant you that. 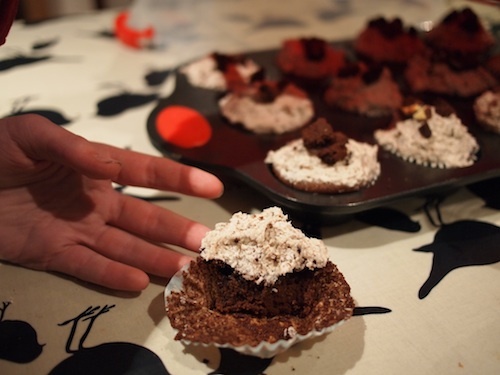 You realise, of course, that these are just chocolate cupcakes with vanilla icing with cookies stirred into both? Nicholas: If you want to be technical about it, yes, I know that. But they’re still great. Maureen: The instructions are still rubbish, but they are good. They’re a little too sweet for me, but that’s me. Nicholas: I disagree. They’re perfect. Yum. Maureen: I can’t believe you’re double digits now. I also can’t believe that you chose to go with a new birthday cake. We’ve been eating the chocolate cake I make for birthdays since Andrew turned three. Nicholas (10): Well, I wanted to try something new. It might be a risk, but sometimes risks pay off. Besides, we’ve liked everything from the Hummingbird Bakery book so far. Andrew (13): You’re right. Mom, you should make the devil’s food cake they have at Hummingbird. Is that in this book? Nicholas: No. It’s in one of the earlier books. I checked. Maureen: OK. I can make that. But only after we’ve finished this cake and/or this month is over. Whichever comes first. 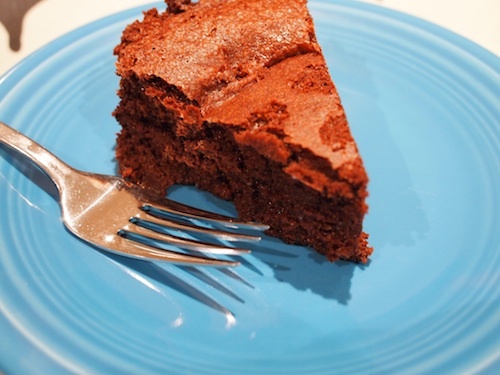 – “Henry’s Quick Chocolate Cake” from “Leon 2”. It was, in short, another triumph. I’m getting to be quite the expert on making flourless chocolate cake. This one differed in that you make a sugar syrup, which you then add to the chocolate. But this recipe was a revelation in another respect: you bake it in a water bath (or bain-marie, if you want to be technical about it), which prevented the cake from falling. Let me say that again: This Flourless Chocolate Cake Did Not Fall. I don’t mind when they fall, actually. You have to embrace that aspect of its personality, and frankly, it’s still delicious, so it doesn’t much matter. But using the water bath is a simple solution to prevent that from happening, so I will do that again, no matter what the recipe. I also need to take a minute to talk about the consistency of this cake. It was like eating a slice of chocolate mousse. It was light and creamy and chocolately and dense, all at the same time. It would seem impossible that could be so, but it in this case, it really was. 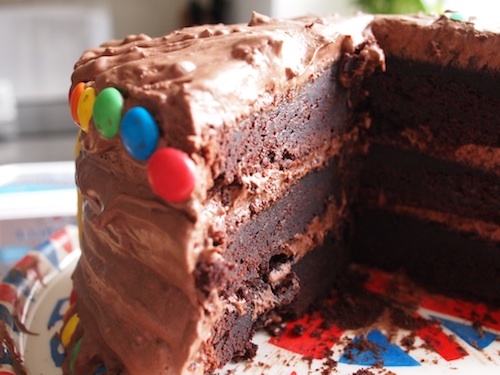 So chalk up this latest version of Flourless Chocolate Cake as an Epic Win. Yum. Maureen: OK. Let’s make some cookies. Nicholas (9): Are we making chocolate chip cookies, like we always do? Maureen: Nope. We’re tying something different. Peanut butter and chocolate. Nicholas: Yum. Sounds like a Reese’s Peanut Butter Cup, in a cookie. Maureen: They’re much flatter in the book. These are all puffy. Nicholas: You’re right. They don’t look like the ones in the book at all. Maureen: Also, I just realised that while they had vanilla in the ingredients list, they forgot to include it in the instructions. So there’s no vanilla in these, even though there should be. Nicholas: I can definitely taste that there’s no vanilla. Maureen (laughing): No way. I don’t believe that. It does make me worry that the book hasn’t been proofread, which might be a problem down the line. What do you think of them? NIcholas: They’re delicious. They’re like the peanut butter cookies you make, but with chocolate too. I really like them. Maureen: They might be best straight out of the oven when the inside is still all soft and warm. Nicholas: Maybe next time when we make them, we should criss-cross them with a fork, like we do with regular peanut butter cookies. Maureen: Good idea! That would make them flat, like they are in the book. Nicholas: We should definitely make them again, though. Do you want to make this? Go on. They are amazing. The recipe can be found on Red Online by clicking through this link. Maureen: These are outrageously good. Maureen: My obsession with all things caramel really started when we went to Normandy for Easter. I loved how there were different pots of caramel nearly everywhere we went. Yum. Tim: We managed to bring a fair few of those pots back with us. Maureen: I know. I’m hoarding them because they’re so good. Since I never had made this recipe before, I didn’t want to use one of the special Normandy caramel pots for it, so I used just bog-standard tinned caramel for it instead. Tim: It’s not bad caramel, but it’s not as good as the French stuff. Maureen: Yes, you’re right. But now that I know this recipe works and is good, I’ll use the good French stuff next time. Tim: You might want to stick with the regular caramel that we can source here, if you’re going to bake it into the cupcakes and save the good stuff when we’re just spreading it on to bread. Maureen: I have to say this recipe was a bit of a faff, given that you have to make the cupcakes, core the cupcakes, add caramel inside, make the frosting and then apply the frosting. But the results are worth it. These are delicious. Andrew (13): I like how when you bite into them, you get a mouthful of caramel. It’s like a caramel surprise. Maureen: Yes, I like that too. This is not your typical cupcake.